I have a good idea how events will play out over the coming weeks after the Obamaquester spending cuts kick in. The blamestorming from Team Obama and the State Run Media will be fierce for a few weeks but once their dire projections fail to materialize, there will be better times once we push through it. The Sequester Cuts were Obama’s idea. The 2013 budget cuts amount to $85 billion which works out to 2.4% of the estimated $3.6 trillion our Federal Government will spend in 2013. So, even though the Sequester cuts were Obama’s idea and the cuts are a mere 2.4% of our estimated spending in 2013, Obama is telling the American people that these cuts will be devastating. 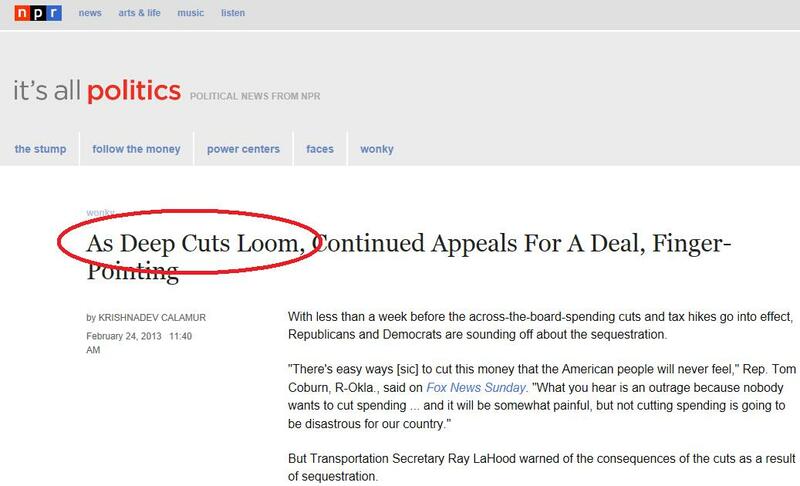 Even NPR is supporting the Obama message by generating this scary headline. As was pointed out in a comment from one of my recent blog posts, the American people were forced to cut their paychecks by 2% when the payroll tax holiday expired in January so we should expect our Federal Government to (at least) match those cuts in their own spending. 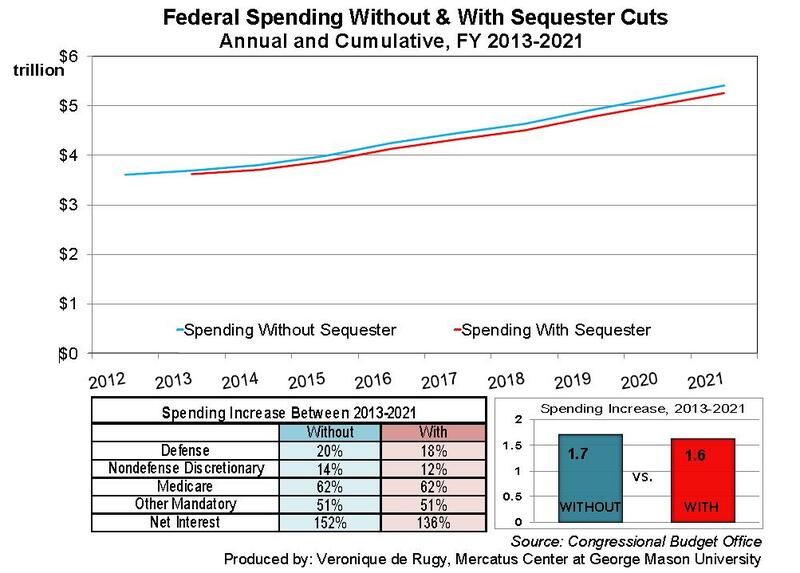 The Mercatus Center at George Mason University put together this chart showing the Federal Government spending with and without the Obamaquester cuts and you can see these ‘deep’ cuts are nothing of the kind. Notice that spending is STILL INCREASING but that won’t stop Team Obama from demagoguing those who oppose these minimal cuts. In the week after the Obamaquester cuts kick in you can expect to see each of Obama’s cabinet Secretaries calling separate press conferences where they’ll tell how these ‘devastating’ cuts are hurting America. Secretary of State John Kerry will tell us how massive cuts in his department will hamper National Security. Secretary of the Treasury Neil Wolin will tell us how cuts to his department will curtail efforts to prevent money flowing to terrorist organizations. Secretary of Defense Leon Panetta will tell us how cuts to his department will force civilian contractors to have reduced work weeks and will hurt our national security and hurt the economy. Attorney General Eric Holder will tell us how cuts to his department will force prosecutors to let criminals go free. Secretary of the Interior Kenneth Salazar will tell us how cuts to his department will limit oil/gas permitting and will drive up energy prices. Secretary of Agriculture Thomas Vilsack will tell us how cuts to his department will shut down meat plants. Secretary of Commerce Rebecca Blank will tell us how cuts to her department will limit patent approvals which will hurt startups and the economy. Acting Secretary of Labor Seth Harris will tell us how Obamaquester will be the reason for the increased Unemployment rate we’ll see in March. Secretary of Health and Human Services Kathleen Sebelius will tell us how cuts to her department will result in people being turned away from hospitals and implementation of Obamacare will be delayed. Secretary of Housing and Urban Development Shaun L. S. Donovan will tell us how cuts to his department will result in hundreds of thousands more homeless. Secretary of Transportation Ray LaHood will tell us how cuts to his department will result in flight cancellations and vital road projects put on hold. Secretary of Energy Steven Chu will tell us how cuts to his department will result in rendering our energy grid less secure and scuttle many green energy projects. Secretary of Education Arne Duncan will tell us how cuts to his department will result in kids being booted from Head Start programs and massive teacher layoffs. Secretary of Veterans Affairs Eric Shinseki will tell us how cuts to his department will result in closing VA hospitals and longer waits for wounded veterans coming home from Afghanistan. Secretary of Homeland Security Janet Napolitano will tell us how cuts to her department will result in limited border security, decreased security in airports and limit their fight against terrorism. After weeks of the Obama cabinet spewing their fear mongering and the State Run Media parroting the memes, Americans will slowly realize that all the gloom and doom never materialized. The economy was not affected. Our national security was not compromised. Cutting Federal Government spending was actually a good thing. Maybe we should do more to limit our Federal Government spending. After the Obamaquester cuts hit, the blowback will be sever but have faith. We need to lean into the Team Obama scare tactics for a few weeks and good things will come out of it. The primary weapon of Obama – Government spending cuts will hurt America – will be utterly destroyed and he’ll never be able to use it again. We must push through this Obamaquester spending cuts to reach a turning point in the US. There is a great editorial in yesterday’s Washington Post from Bob Woodward on how Obama flat out lied on the Sequester and who proposed it. When the administration was pushed on it, they lied again. It’s all you need to know about Obama. Woodward is not known as a conservative fanatic. He is known as a fanatic for the accuracy of his source materials. I believe him when he calls Obama a liar. All true about their strategy, Cosmo. Every word, and then some. But the Statist media and the WH will not play fair (what else is new). They’ll hit and hit and hit and hit that things are “dire”, even when they aren’t. I believe as you do that this is merely a blip (heck, a QUARTER of a blip) in spending. As you said, spending is still increasing! But think back to when Dubya was in office and how they shrieked and wailed about how “bad” everything was, just as they did with Bush Sr when Clinton was running. A percentage of the population WILL believe it, true or not. That’s what we need to fight. Might as well gear up now.